No, we haven’t hit the big time but, at the 18th attempt, we’ve finally notched up the maximum annual quota of white that we’re allowed to produce under the strict Appellation Contrôlée rules. To be fair, we haven’t actually made the wine as yet since we’ve only just finished harvesting our Sauvignon Blanc and Semillon this week; the fermenting, freshly pressed juice is lovely however and we’ll do our best with it, naturally. There’s much to be done but at least the accountant and bank manager will be pleased. We should perhaps have maxed up before now, as we’ve replanted over half the vineyard with double the number of vines per hectare and the same quota applies. Many of the vines were young, though, and we’ve had one or two setbacks along the way. 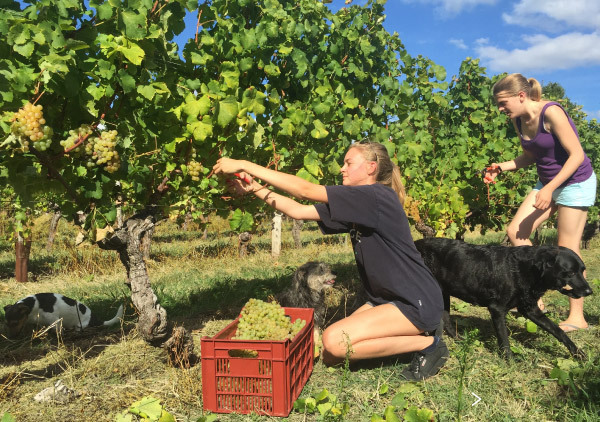 Talking of which, our good fortune this year is in stark contrast to many growers elsewhere in France, whose vines have suffered from late Spring frosts, hail storms and summer drought. It must be our turn in the lucky dip. Meanwhile, the Merlot harvest has kicked off across Bordeaux under clear blue skies and it’s all looking extremely promising.